A new report on funeral poverty by CAS has found funeral director and local authority costs should be more consistent and bereavement support more widely available. he report by John Birrell, chair of the Scottish Working Group on Funeral Poverty, and Citizens Advice Scotland, highlighted factors that contribute to funeral poverty and called on the UK and Scottish Governments, the funeral industry, local authorities and others, to take action. “With funeral costs rising above inflation, and many low income families not having a funeral plan or savings in place for a funeral, we are concerned about funerals being delayed and families taking on unmanageable debt. “This report outlines a number of recommendations to tackle the problem head on, but we know that we can’t solve funeral poverty alone, which is why we will bring together funeral directors, charities, councils and health and social care services for the first ever national conference on funeral poverty. 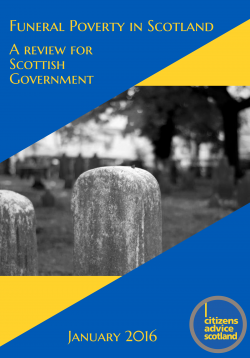 “We know funeral directors will want the best for their customers and we plan to work with them and others to explore the recommendations in the report including whether services could be offered through a ‘Scottish Funeral Bond’ scheme. This could help unlock lower cost options for people who choose them. “As the cost of funerals continues to rise, we have identified four key areas where action is needed – the cost of the burial or cremation, the funeral director costs, the inadequacy of the Department and Work and Pensions’ support and the choices made by those arranging funerals. For each of these we have brought forward suggestions for action. “Scottish CAB advisers have been reporting significant increases in the numbers of people coming to them for advice on funeral costs. In the last year alone the number of cases has risen by 35 per cent with approximately one in every 30 funerals in Scotland resulting in someone seeking advice from Citizens Advice. These cases often come as part of a complex set of circumstance for the client, including struggling with low incomes, servicing unsustainable debt, struggles with family relationships and relying on crisis support, as well as grieving for the loss of a family member or friend. The Burial and Cremation (Scotland) Bill which is about to complete stage 1 in the Scottish Parliament contains provision for the re-use of burial lairs and for powers which will allow Ministers to introduce a licensing scheme for funeral directors.http://www.parliament.scot/parliamentarybusiness/Bills/92664.aspx. The Smith Commission recommended that the Regulated Social Fund, including funeral payments, should be devolved to Scotland.